Formed in 2000 in Aberystwyth when I was in the right place to catch them and a highlight of their sets was covering Walk Like An Egyptian, the band quickly moved on to confidently pulling in the crowds with their own material. Often bittersweet, often intellectual, but with a persistent ear for pop hooks and sing-along lines, distinctive vocals and a fondness for the theremin, it's a shame they didn't have greater success whilst they were active – second album Blue Hands was critically well-reviewed for the most part but delayed coming out, by which time two of the band members were settling down to raise a family. Definitely worth checking out if you like what you hear is the self-released retrospective Over My Dead Body, a collection of older material that captures their early live energy on some tracks. 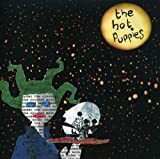 Capturing the transition between student band and twenty-something hedonism the Puppies made their own, this first album is an enjoyable romp taking in the Roaring Twenties, Hitchcock and heartbreak. Get your flapper threads on and rock out.